Railroad crossing ahead. 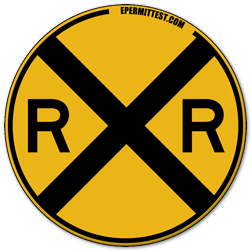 A round yellow warning sign with an “X” symbol and black “RR” letters. This sign is posted a few hundred feet in front of the tracks and alerts you to slow down, look, listen and prepare to stop. If necessary, roll down a window and listen carefully for an approaching train. If a train is approaching, stop! Do not try to calculate whether you can “make it” across the track. Never try to beat a train through the intersection. Passing is prohibited at all railroad crossings.